Data must convince a human colony to evacuate their homes while Captain Picard negotiates with the alien race that is ready to eradicate it. I respect what the writers are trying to do in the opening scene by having Picard give Data pointers on how to command, since that gets at the theme of this episode, but it's a little strange. The conversation seems forced, because though they are talking naturally about Data needing to project confidence in order for his musical performance to succeed, there is absolutely no context in which to have a discussion about the nature of leadership. The point could have easily been made without talking about leadership, just by Picard telling Data that excessive honesty can be detrimental. There are supposed to be over 15,000 colonists, but the colony doesn't seem large enough to hold even a tenth of that number. The Sheliak look really dumb, like some guy standing around with a comforter over his head, waving his arms around slowly. 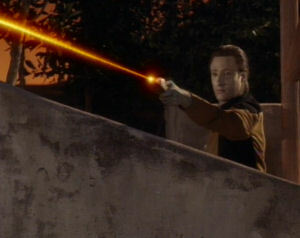 Too bad Data's down on the planet, because he'd be incredibly useful in combing through the treaty. "You enjoyed that." "You're damned right." Love it. This is an excellent episode that gives Data lots of room to grow naturally as a character. I can nitpick it until the cows come home, but at the end of the day, it's a really good bit of Trek. I like how it forces Data to continually up the ante and get more "creative," while simultaneously showing Picard having to do the same thing with the Sheliak. As I said a few episodes ago, the need to come up with creative solutions to intractable situations is becoming one of the central themes of this show, and this episode is the best example yet.